It's great when an architect or engineer is involved in the design of a really notable project just minutes from their office. 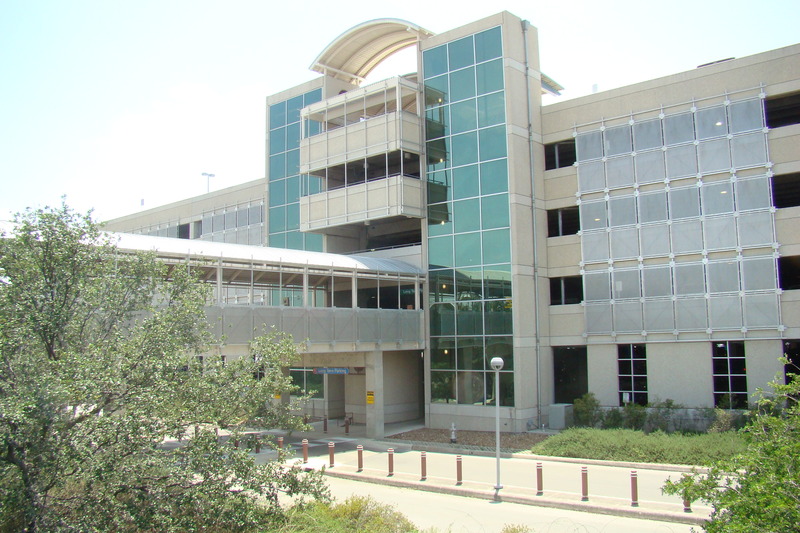 Recently, CEG Texas had that opportunity as specialty engineer for the new 2700-car parking facility at the San Antonio International Airport. As part of an extensive parking expansion program, the new 5-level facility provides over 900,000-sq. ft. of space. Construction was sequenced to allow half of the garage to be open four months before the entire structure opened in the fall of 1999. Locally based Manufactured Concrete, Ltd. (MANCO) provided over 2500 pieces of precast for the structure, which includes two pedestrian bridges, glass enclosed stair and elevator shafts and forty-five foot radius corners. In keeping with its southwestern location, the garage is split by a paseo, which is a Spanish term for walkway area. The paseo is covered by a multi-colored panelized roof, which produces rainbow effects throughout the day. Framing of the paseo provided an engineering, erection and production challenge with its seven-foot walkway slabs cantilevering from architectural L-beams. Special torsional connections were required to prevent rolling of the beams during and after erection. The L-beams had a sandblasted/retarded finish on their vertical exposed face to match the exterior spandrels and walls. 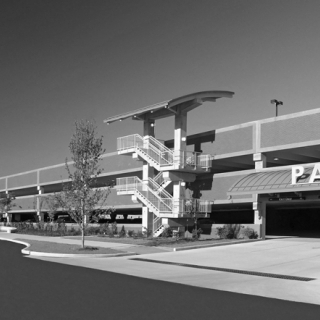 The openness and layout of the paseo provides an enjoyable, peaceful atmosphere for pedestrians on their journey through the garage. A unique floor drainage system was also incorporated into the deck. 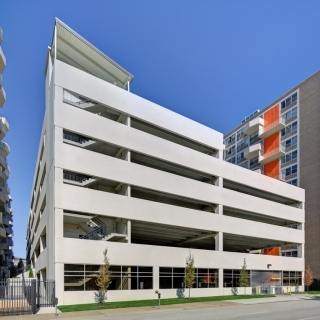 To match an existing garage, the entire deck was sloped over seven-feet diagonally across the structure. This created no flat spots in the garage and no two points with the same elevation. 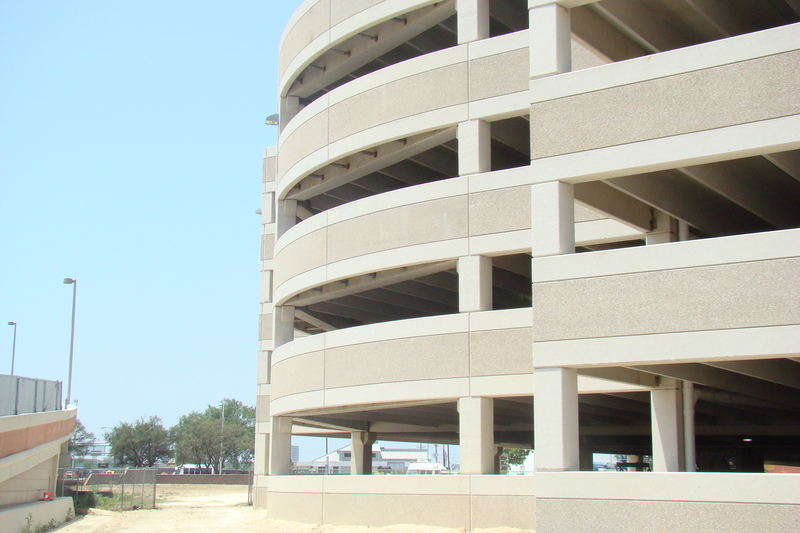 Coordination between cast-in-place and precast elevations required special cooperation between trades, which CEG controlled successfully with the help of the contractor, Bartlett Cocke. Being so close to the office, the project provided an excellent learning opportunity, especially for the newer CEG staff and lunchtime jobsite visits were common. The personal satisfaction of seeing the structure fit together was enjoyed by the whole staff. 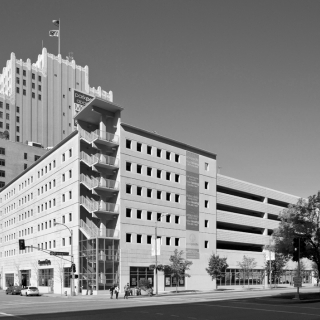 So the next time you are in San Antonio, ask for a personal tour of this outstanding structure and see for yourself how precast concrete can accommodate a variety of challenging functions.